"Two Words" by Isabel Allende is an emotional story which belongs to the genre of magic realism. The most well-known writer of this genre is Gabriel Garcia Marcus. His famous novel is "One Hundred Years of Solitude" was also about South American history and people. 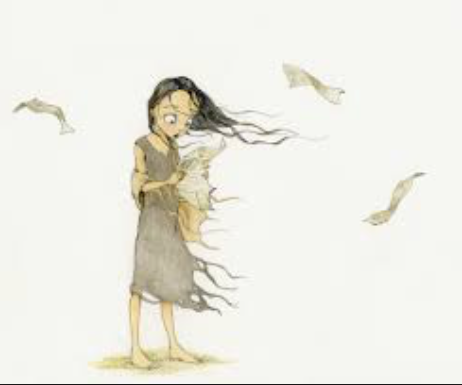 The story started with describing a struggling people based on the example of one girl, Belisa Crepusculario, who survived extremely severe conditions of life. She paid her last money for studying, reading and writing. She made it her life’s profession. She made a living by writing letters to people traveling across the country. They included official letters to authorities or the courts, letters to customers’ relatives who lived in other parts of the country, love letters and so on. Belisa gave as an additional gift for people who used her works - two secret words. The person who got these words kept them in secret, and in times of difficulty, they helped the person cope with problems. While she was traveling in a remote village, she was captured by rebels. She was tied by ropes and delivered to the head of the rebels - the Colonel. The rebels were known among the population for their cruel acts towards the people. Belisa was horrified by what happened, but when she saw the leader of the rebels, strangely, she felt sympathy for him. The Colonel said that he was going to run for President in the next election and asked Belisia to prepare him a speech for the people. She did, and it was very persuasive and emotional. The Colonel was thankful to Belisia for this service, and when she suggested giving him two secret words as a gift, he agreed as he didn't want to be impolite to her. The speech was met with great success. The people believed that the Colonel was able to lead the country to a bright future. However, it seemed that the dreams of the Colonel were out of reach. His helper, El Mulato was worried about it and they captured and he delivered Belisia to the Colonel again. El Mulato led his prisoner before the Candidate. "I brought this witch here so you can give her back her words, Colonel," El Mulato said, pointing the barrel of his rifle at the woman's head. "And then she can give you back your manhood." The Colonel and Belisa Crepusculario stared at each other, measuring one another from a distance. The men knew then that their leader would never undo the witchcraft of those accursed words, because the whole world could see the voracious-puma eyes soften as the woman walked to him and took his hand in hers." The story gives readers lots of positive emotions, it is very well written, it has a high rating.